The New Improved Atex LED Worklite gives more light and a longer duration, with better protection from harsh explosive environments – the market-leading ATEX Worklite just got better! Since 2007 the Wolf ATEX Worklite has been widely used in some of the harshest environments around the world, including especially demanding operations in North Sea offshore tank cleaning. Tried and tested, and with a long, proven history of reliability, it has developed a well-deserved reputation for durability and toughness. 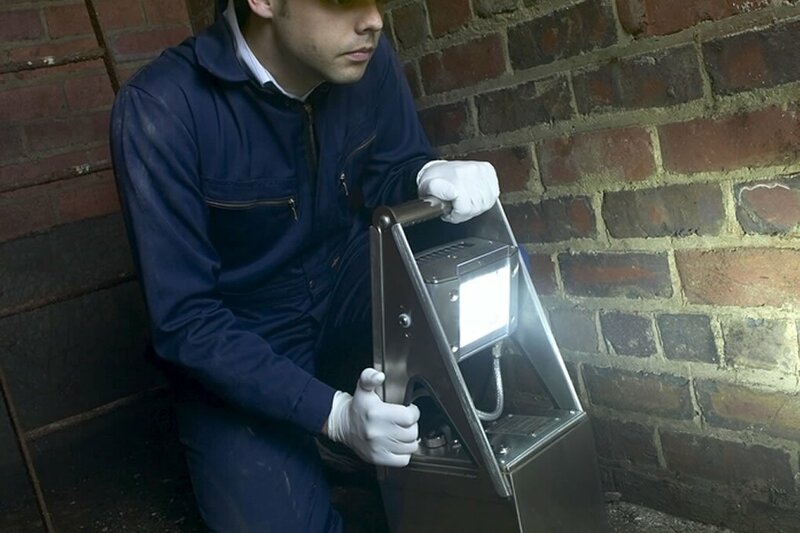 Now, taking full advantage of the latest advances in technology, the New Improved Atex LED Worklite boasts a number of substantial improvements – including a trebling of light output to 3,100 lumens (at source), a doubling of light duration up to a maximum of 40 hours and a fourfold increase in LED life to 100,000 hours plus. It is now both IECEx, as well as ATEX, certified, being fully compliant to latest standards, including OPIS – Optical Intrinsic Safety. Utilising state of the art LED technology in the New Improved Atex LED Worklite has enabled a 3-fold increase in light output – with up to 3,100 lumens now being emitted at source, an increase from just over 1,000 lumens for previous models. Not only is the beam brighter, but shadowing is reduced by multiple light sources – the LED panel has 18 LEDs, with each LED having an encapsulated optical device. This patented design gives a piercing spot beam which gives excellent long-distance illumination and a flood of lower level fringe light. The high reliability LEDs are designed to give over 100,000 hours life, with LED longevity assured by efficient heat dissipation through built in fins in the LED head unit. Improvements in LED efficiency have enabled the doubling of duration on some settings, with a maximum of up to 40 hours duration on low power for the WL-85. Being battery powered, the Worklite can function as an “emergency” light and will not leave you in the dark if mains power fails when charging in the safe area. The newly improved WL-80 and WL-85 feature increased ingress protection, being certified to both IP66 and 67 – “dust tight” and protected against powerful jets of water, heavy seas and immersion. With no external moving parts, the new, fully sealed piezo switch eliminates the risk of both dust and shot blast contamination further improving reliability. The new and improved Worklite retains the Stainless Steel casing and Aluminium lamp head, ensuring that the new versions are as solid and robust as always and will withstand even the harshest environment or shot blast operations. Light output and duration performance improvements mean that the performance of the new and improved WL-80 matches the performance of the old WL-85 – whilst weighing 6 ½ KG (almost 30%) less. The WL-85 has been improved even further, with battery duration on low power being a class leading 40 hours. All Wolf Worklites come supplied with a disposable anti-static Lens Guards to protect the lens in shot blasting and painting applications, which can be re-ordered on the W-200 part number. Full details of Wolf Worklites can be found here.